“From 1957 to 1972 the artistic and political movement known as the Situationist International (SI) worked aggressively to subvert the conservative ideology of the Western world. The movement’s broadside attack on “establishment” institutions and values left its mark upon the libertarian left, the counterculture, the revolutionary events of 1968, and more recent phenomena from punk to postmodernism. But over time it tended to obscure Situationism’s own founding principles. 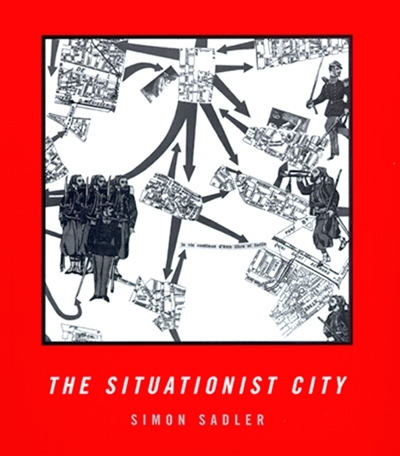 In this book, Simon Sadler investigates the artistic, architectural, and cultural theories that were once the foundations of Situationist thought, particularly as they applied to the form of the modern city. According to the Situationists, the benign professionalism of architecture and design had led to a sterilization of the world that threatened to wipe out any sense of spontaneity or playfulness. The Situationists hankered after the “pioneer spirit” of the modernist period, when new ideas, such as those of Marx, Freud, and Nietzsche, still felt fresh and vital. By the late fifties, movements such as British and American Pop Art and French Nouveau Ralisme had become intensely interested in everyday life, space, and mass culture. The SI aimed to convert this interest into a revolution—at the level of the city itself. Their principle for the reorganization of cities was simple and seductive: let the citizens themselves decide what spaces and architecture they want to live in and how they wish to live in them. This would instantly undermine the powers of state, bureaucracy, capital, and imperialism, thereby revolutionizing people’s everyday lives. Reviews: Andrew Hussey (LRB, 1999), Notbored (n.d.), Andy Merrifield (Harvard Design Mag, 2000), Rosemary Wakeman (French Polit Cult Soc, 2000), James L. Penner (TDR, 2001), Sarah Deyong (J Society Arch Hist, 2001), Benedict Seymour (Mute, 2004), Natasha Gershfield (Manchester School Arch, 2010).